Is pneumonia contagious? It most certainly can be. 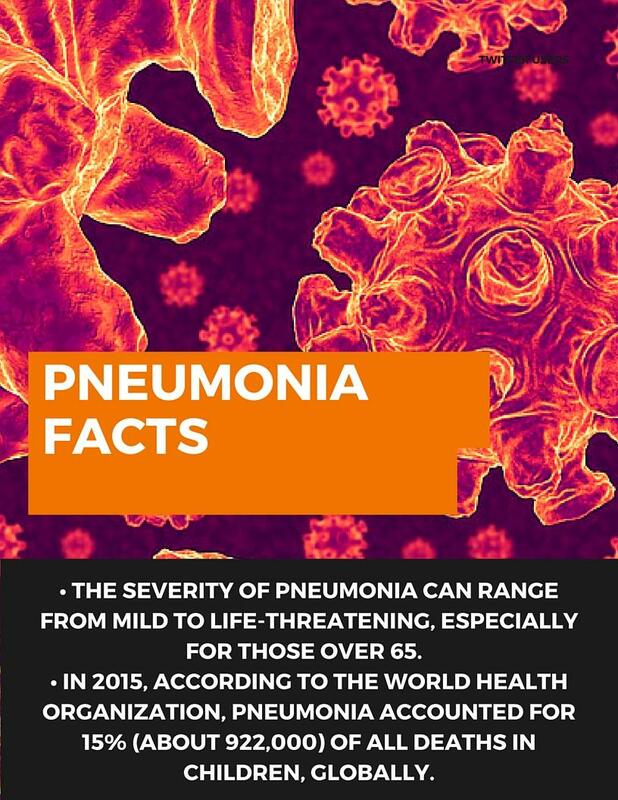 Pneumonia (1) is a condition in which lung tissue becomes inflamed due to a bacterial, viral, or fungal infection and the alveoli (air sacs) fill with pus or fluid, making it difficult to breathe. Sometimes, pneumonia is also caused by inhaling toxic fumes which damage the lungs. How long is pneumonia contagious? It depends on the source and how severe it is. The severity of pneumonia can range from mild to life-threatening, and the latter is especially true for those over 65. How severe it depends on what caused the inflammation, plus your age and overall health are also factors. The more frail you are, the harder it will be to combat the illness, plus your chances of getting it again, often after a cold or flu, are higher. In 2015, according to the World Health Organization, pneumonia accounted for 15% (about 922,000) of all deaths in children, globally. The first line of treatment for pneumonia is a course of antibiotics, and the length of that treatment depends on the severity of the illness. Immunization, a healthy environment, and proper nutrition can all help prevent the onset of pneumonia. How Long Is Pneumonia Contagious after Antibiotics Treatment? Do Antibiotics Work for Pneumonia? Pneumonia: A Risk Factor for Pyogenic Liver Abscess? Is pneumonia contagious in adults? Just like colds and the flu, pneumonia can be contagious by spreading droplets of infectious liquid into the environment, e.g., through coughing or tactile transmission. It’s difficult to pinpoint exactly when pneumonia becomes contagious, because it depends on what caused it, so it could be anywhere from two days to two weeks following exposure to the pathogen. Generally speaking, most cases of pneumonia are less contagious about 24 to 48 hours after antibiotics have been introduced. In viral cases of pneumonia, the risk for spreading can go down once symptoms have begun to recede. But even if the fever has disappeared for two days, it’s still possible for symptoms to spread, so be careful. Basically, it’s a good idea to steer clear of people who have pneumonia; and if you’ve got pneumonia, then stay away from people and public places while you’re fighting it off. Pneumonia is contagious in babies as it is in adults, but there is a preventative measure mothers can employ that will help: breastfeeding. Breastfeeding allows the mother to pass on antigens to her baby in breastmilk, and these will help fight off bacteria and viruses by inducing a positive immune response in the baby. Babies usually get a milder form of pneumonia called “walking pneumonia.” We will explore this further, below. 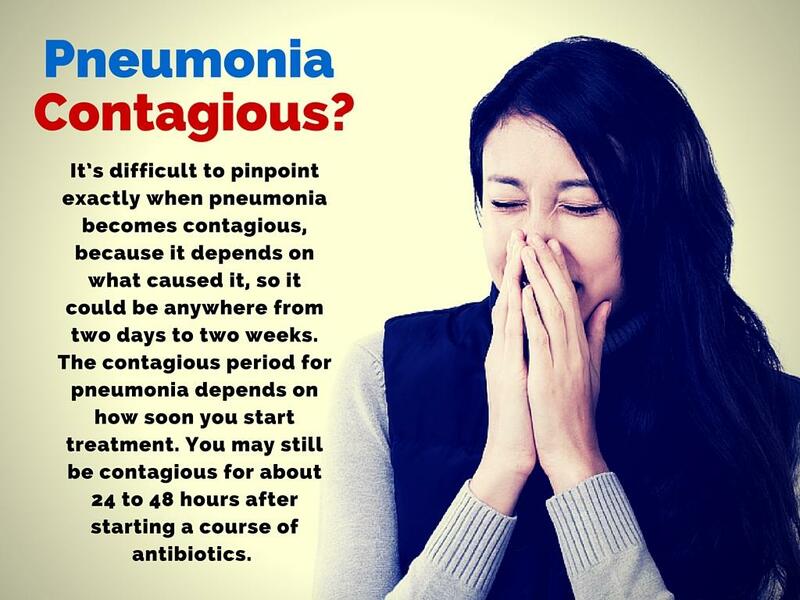 The contagious period for pneumonia depends on how soon you start treatment. As noted above, you may still be contagious for about 24 to 48 hours after starting a course of antibiotics. That said, certain bacterial infections may leave you contagious after more than two weeks of antibiotic treatment. It’s important to complete the entire course of antibiotics with no days missed—if not, you might still have some pathogens lingering, which could start up the infection again and make you contagious again. Many people walk around with the illness without knowing it, and the best way to prevent spreading it to others is to start a treatment of antibiotics as soon as possible. If, after a cold or flu, you notice that your symptoms haven’t disappeared or subsided in a week’s time, be sure to visit the doctor to be tested for pneumonia. Many people walk around with the illness without knowing it, and the best way to prevent spreading it to others is to start a treatment of antibiotics as soon as possible. If you really want to play it safe for the sake of those around you, you could always act as though you’re contagious for up to two weeks afterward by refraining from contact, covering your nose and mouth if you sneeze, and washing your hands frequently. Depending on the source and severity of your pneumonia, you could be subjected to one of two common treatments. And although antibiotics are always thought of as the go-to treatment for pneumonia, they aren’t always effective. There are two major types of pneumonia: bacterial and viral. If you’ve been infected by a bacterial strain, you’ll likely be treated effectively with a cycle of antibiotics. Again, it’s important to complete the entire course of the prescription even if you feel better. Bacteria can linger without any symptoms and can proliferate if the cycle is not completed. In cases of viral pneumonia, however, antibiotics won’t work. Doctors will prescribe an antiviral drug to treat these cases, and it should cure the condition in roughly one to three weeks. You can aid the medication by drinking plenty of fluids and getting rest. 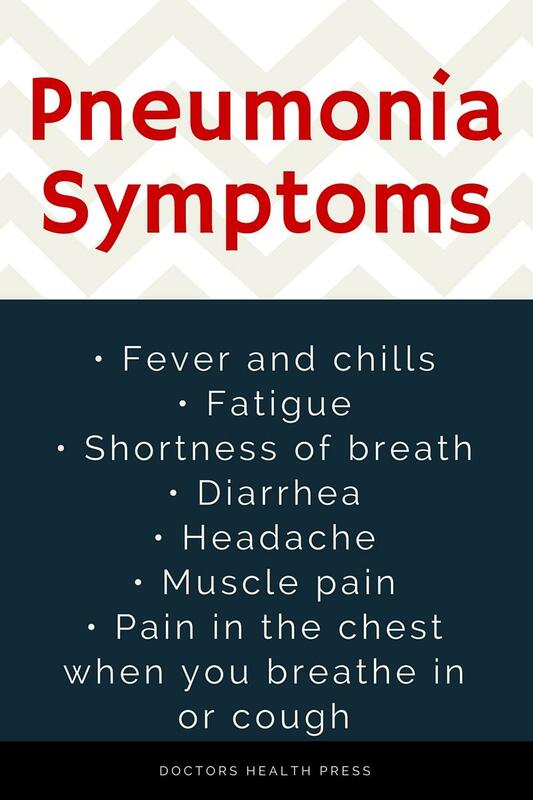 There are different types of pneumonia that require different treatments, have varying durations, and can pose unique threats. Bacterial pneumonia: A bacterial infection of the lungs, this type of pneumonia is most commonly caused by Streptococcus pneumoniae. The infection impacts the lungs by filling air sacs with fluid, leading to inflammation. Because bacteria must be killed for health to be restored, antibiotics are the preferred treatment. Walking pneumonia: This non-medical term is used to describe mild cases of pneumonia. Treatment depends on the origin, but it can usually be treated with over-the-counter medications, as well as plenty rest and fluid consumption. The symptoms are essentially a lighter version of pneumonia—perhaps feeling like a bad cold. Viral pneumonia: This happens when your lungs are infected by a virus like influenza, rhinovirus, coronavirus, or respiratory syncytial virus (RSV). These account for about 30% of the total pneumonia cases in the U.S. and will be treated with antiviral medication. The infection is highly contagious and can spread quickly. Fungal pneumonia: A very dangerous variety of pneumonia caused by a fungal infection in the lungs, it is relatively common in the southwestern U.S. Fungal pneumonia has very strong symptoms, and hospitalization is required for more than 40% of diagnosed cases. Exposure to endemic fungus is a major risk factor, and it is not contagious. Aspiration pneumonia: If food, drink, vomit, or saliva is inhaled into the lungs, it can lead to an infection. It is more likely to occur in individuals who have regular disruptions with normal gag reflexes. Brain injuries, swallowing problems, and excessive drug or alcohol use are risk factors. Healthy lungs will clear up on their own. Pain in the chest when you breathe in or cough. In some cases anemia, an ear infection, and a skin rash can develop. It’s typical for these symptoms to appear about three days to a week after flu-like symptoms develop. If any of the above are accompanied by flu-like symptoms, see your doctor so that you can rule out pneumonia. If it turns out that you do have pneumonia, it’s better to catch it earlier than later. Remember, pneumonia can land you in the hospital, so don’t delay in seeing your doctor. A pyogenic liver abscess (PLA) is a pocket of pus forming on the liver resulting from a bacterial infection. It can lead to severe illness and death, and a June 2017 study indicates that pneumonia may be an independent risk factor. The study showed a close association between PLA and patients who were hospitalized for bacterial pneumonia for 30 to 180 days. Because PLA is the result of bacteria exposure in the liver and a compromised immune system significantly boosts the likelihood of bacteria spreading, it seems to make sense that these conditions are closely associated. It’s not uncommon for pneumonia survivors to acquire additional bacterial infections after initial treatment because of their weakened immune system. Although antibiotic treatment is required to kill bacterial pneumonia, it also leaves your immune system unprepared to deal with invaders in the period shortly following treatment. The immune system needs to repopulate itself with helpful bacteria, and until that happens, there is an increased risk for further infections like PLA. Research has indicated that in Taiwan, for example, the most common pathogen of PLA is Klebsiella pneumoniae. This bacterium lives in the intestines, where it is normally harmless. However, if it gets into the bloodstream or other areas of the body, it can result in pneumonia, PLA, or other problems. If you’ve recently been hospitalized for bacterial pneumonia treatment in the last three months, it’s recommended that you keep an eye on the potential for PLA. Talk to your doctor about how to effectively monitor this risk. What Increases Your Risk of Developing Pneumonia? Smoking—cigarette smoking is the strongest risk factor for healthy young people. Because you’ll need a doctor to prescribe antibiotics or some antiviral medications, it’s worthwhile to visit the doctor if you’re experiencing symptoms for more than a few days. Sometimes, however, more severe symptoms can arise—even if treatment is already underway—that should prompt a doctor’s visit. Pneumonia can be life-threatening if not treated, and even mild cases can linger for months without treatment. It’s best to get examined if your symptoms last for a few days, and even more important if you’re experiencing any of the issues mentioned above.